This cemetery has to be one of our oldest. 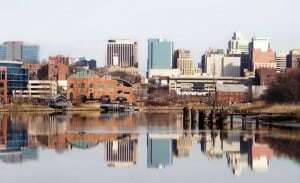 It is located on land that once belonged to Jacob Moore, one of Amwell’s earliest settlers, who lived from about 1690 to about 1770. 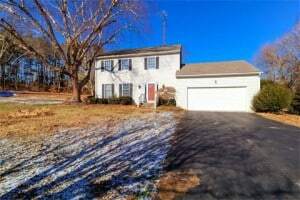 It is one of the prettiest locations in the township, overlooking rolling hills and farm fields. The cemetery is surrounded by a stone wall and at one time had a wrought iron gate. According to Moore family tradition, Jacob Moore came to Amwell around 1705, one of the very first Europeans to come here, and established his plantation near Haines Road and Rosemont-Ringoes Road. He and his wife Amy are probably buried in the Moore cemetery, but their stones cannot be found. Hiram Deats wrote that there are two other burying grounds on this farm near the house but no lettered stones were remembered by older people. When Deats first visited them in the 1930s he saw nothing but field stone markers, with no lettering. 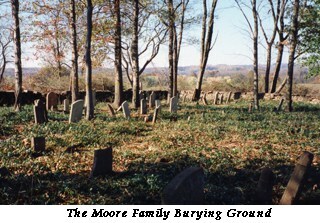 Perhaps that is where the earliest Moores are buried. Moore Family tradition tells us that Jacob Moore met his future wife, Anna Apolonia (Amy) Moret, on the boat that took both of them from Germany to America. Jacob departed for Amwell, looking for the right place to settle, leaving Amy back in New York. When he found the right place, he proceeded to build a log house for his future family. But he needed shelter while the house was being built, so he made his home in the hollow of a very large old tree. 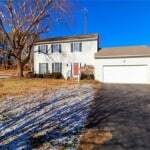 The house was enlarged many times to accommodate his growing family. It was four stories high, very unusual for Amwell; but it burned down in the 1930s. The Moores are a good example of the anglicizing of German names that took place among Amwell settlers. Mohr became Moore. 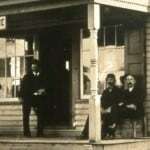 Other family names who settled near the Moores are Young (Jung), Fox (Fuchs), Rake (Rauche or Racke), Sine (Sayn or Sein), Hoppock (Habbaugh), Bellis (Bellosfelt) Snook (Schnuch). Also Fauss, Lawshe and Rouser. There is a reason why the Moore family name is common in early Delaware Township. Jacob Moore Sr. had ten children, most of his children had nine or ten children also, and many of them lived to advanced age. 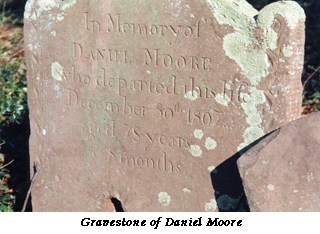 Daniel Moore, son of Jacob and Amy Moore, was one of the most prolific. 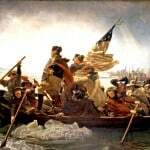 He had nine children with his first wife, Catharine Storts, and eleven children with his second wife, Elizabeth Rouser. 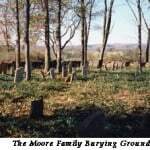 There are 38 members of the Moore family in this cemetery, plus fieldstones with initials: D. M., E. M., and H. M. There is no other surname here beginning with M.
The son of Jacob and Amy Moore, Jacob Moore Jr. (1723-1784) and his wife Christeen(1721-1816) are buried in the Moore Cemetery; also their son Daniel Moore (1729-1807) and wife Elizabeth Rouser (1748-1819); and his brother Henry Moore Sr. (1738-1816) and wife Mary Groff (1745-1833). Moore family tradition has it that the cemetery began for the family’s use, but in time, members of the Amwell German Baptist Church were allowed in. This is a convincing argument since the Rev. John Naas is buried here. In 1733, several Germans from Amwell Twp. traveled to Philadelphia to meet with the Rev. Naas, newly arrived from Germany. They persuaded him to minister to their church in Amwell. One of those Germans from Amwell was Jacob Moore, who offered some of his land to the Reverend as an inducement. 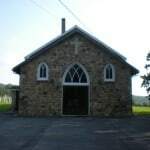 The German Baptist Church, also known as the Dunkard Church for their style of baptism, was given a firm foundation by Rev. Naas, but he died early, in 1741, and was buried in the Moore cemetery. That was probably why other members of the congregation wished to be buried there. This practice continued until 1839, when a funeral held on a rainy day did much damage to Gideon Moore’s wheat crop. 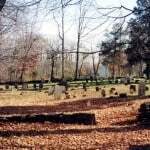 To prevent this from happening again, he gave an acre of land next to the church for a burying ground, which later became known as the Lower Amwell Old Yard or Dunkard Church Cemetery. Gideon Moore (1775-1840), grandson of Jacob and Amy, is buried here in the Moore cemetery, along with wife Catharine Yorks (1777-1854). Some of the family names that can be found here are Acker, Busenbury, Courson, Dalrymple, Fauss, Furman, Godown, Hainds, Hudnut, Lawshe, Rockafellow, Trimmer, andWoolverton. Job Wolverton (1788-1864), who owned a farm on Covered Bridge Road, is here, along with his first wife Anna Housel (1791-1826). 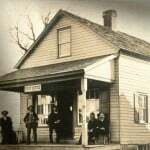 Wolverton was a trustee of Green Sergeant School in 1830, and in 1840 was an Overseer of Roads in Delaware Twp Post. His first wife Anna Housel (1791-1826) is also here. Ann Boss Lair (c.1761-1821) was the daughter of Godfrey Boss who owned land near Locktown, and was married to William Lair Sr. who owned a farm on the north side of the Locktown-Flemington Road, where Whiskey Run Herb Farm used to be. Ann was also the sister of Sarah Boss who also was married to William Lair. William and Sarah Lair are buried near Quakertown, rather than with Ann Boss. Why Ann was buried in the Moore cemetery is a question. Among the earliest German settlers here were the Lawshes. Abraham Lawshe (1732-1819) came with wife Margaret Bechleshammer (1723-1814) in the 1750s. They might be buried here, but their son Henry definitely is. Henry Lawshe (1757-1831) is buried with his two wives, Rachel Allen (1755-1802) and Mary Moore (1777-1846). Mary was the daughter of Daniel Moore and Elizabeth Rouser, and granddaughter of the first Jacob and Amy Moore. She was Henry Lawshe’s second wife. After Henry Lawshe died in 1831, Mary married the Rev. Israel Poulson, on July 31, 1841. By that time, Mary was 64 years old. Rev. 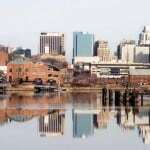 Poulson, who had already buried his first two wives, was 81 years old. But even more amazing, Rev. Poulson’s first two wives were sisters of Mary Moore. The first, Esther Moore, died about 1795 and might be the E. M. mentioned above. 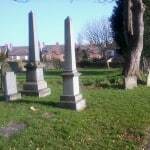 The second was Hannah Moore who died in 1839 and is buried in the Lower Amwell Old Yard. Much could be written of Rev. Poulson, and I hope to do so in another article. Rev. Poulson, who died in 1856, is buried in the Lower Amwell Old Yard. Another of the German families in the Sand Brook area was JacobFauss (1740-1806) and wife Margaret Space(1743-1830), both buried here, along with their son Samuel Fauss(1777-1831) who inherited the family farm, and his wife Mary Moore (1779-1871). Mary Moore was the daughter of Henry Moore and Mary Groff. 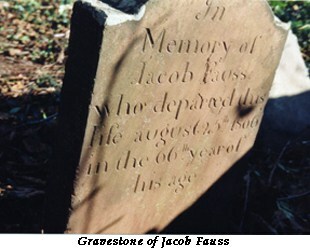 Another son of Jacob and Margaret Space was John Fauss (1782-1825) who is here, but his wife, who outlived him by almost 30 years, is not. That funeral in the 1830s that caused so much damage to Gideon Moore’s wheat field tells us a little of what life was like when the Moore’s were raising their families and burying their dead. The Moore Cemetery is well off the road, so people attending the funeral would have ridden their horses or driven their carriages over the fields to get to the gravesite. When you consider that planting a field of wheat involved a horse-drawn plow and hand sowing, you can easily understand why Gideon Moore was upset. The next in this series on private cemeteries in Delaware Twp. will discuss the Opdycke Family Burying Ground.